Phoenix, AZ - The Sv. Nikola Church-School congregation in Phoenix, Arizona celebrated their fiftieth anniversary last weekend. "Formal and solemn" best describe the atmosphere among the Serbs in metro Phoenix. With their presence three hierarchs elevated the truly great jubilee: the host, Bishop Maxim of Western America, Bishop Longin of New Gracanica and Midwestern America and special guest Bishop Grigorije of Zahum and Hercegovina. There were also guests who came from all over: Hercegovina, Chicago, California, Hawaii. 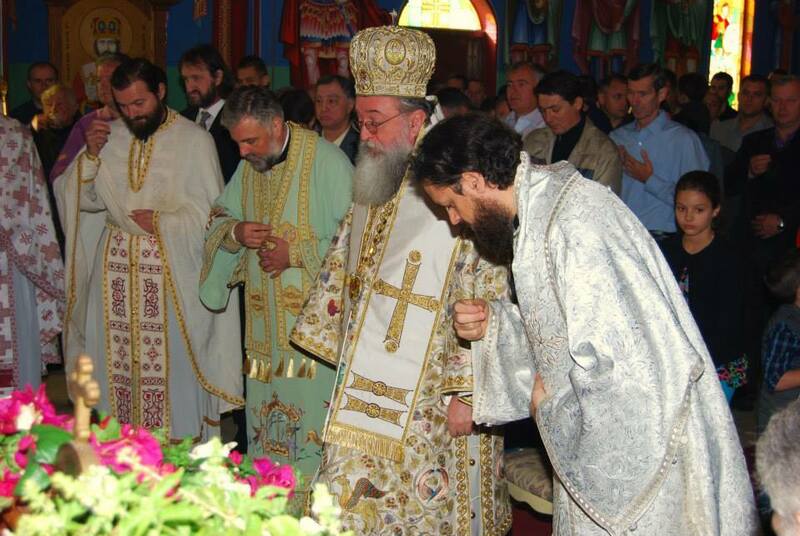 The celebration began with the festal Vespers served by Hieromonk Sava, hegumen of Monastery Tvrdos, in the presence of the aforementioned hierarchs and many faithful. An agape meal followed Vespers which grew into a true spiritual feast as a dialogue ensued between the faithful and bishops. Wishing to use this unique occasion given to them the faithful posed many questions. With true inspiration the bishops replied to all the buring questions. On Sunday, on the feast day of St. Euthymius the Great, the Divine Liturgy was officiated by Bishop Longin. Concelebrating were Bishops Grigorije and Maxim, Hieromonk Sava of Tvrdos, and priests Nikola Ceko from Los Angeles, Dragomir Tuba and the host Stanislava Duric, as well as Deacon Nikolaj Kostur from Chicago and Ozren Todorovic from Las Vegas. Bishop Maxim gave an inspiring homily on the Gospel of Zacchaeus. During the liturgy Fr. Stanislav Duric was elevated to the rank of Protopresbyter. Bishop Longin spoke beautifully, emphasizing Fr. Stanislav's merits which, if one were to visit this parish, are evident; the church is beutifully frescoed with beautiful grounds making it a spiritual oasis for this part of Phoenix. The spiritual life is not neglected as it can be felt pulsating, Bishop Longin noted. The celebration was continued in the parish hall where a meal was served. Speeches and greetings were given during the lunch, as is appropriate for such a day and anniversary. Special attention was given to Bishop Grigorije who gave an emotional speech which moved everyone in attendance. All stood to applaud their dear guest afterwards. The celebration ended with dancing and singing, with a rich cultural program prepared by the folklore groups "Srbija" and "Gavrilo Princip" as well as the ethno group "Breze". Children of all ages, in various folk costumes beautifully showcased the richness of our culture. What else to say in the end but to give thanks to our Triune God, Father, Son and Holy Spirit, Who brought us together so beautifully for this special occasion. We thankful to our dear host Fr. Stanislav Duric, the president of the church school congegration Djordje Ristic and to all who contributed to such a successful celebration of this great anniversary.